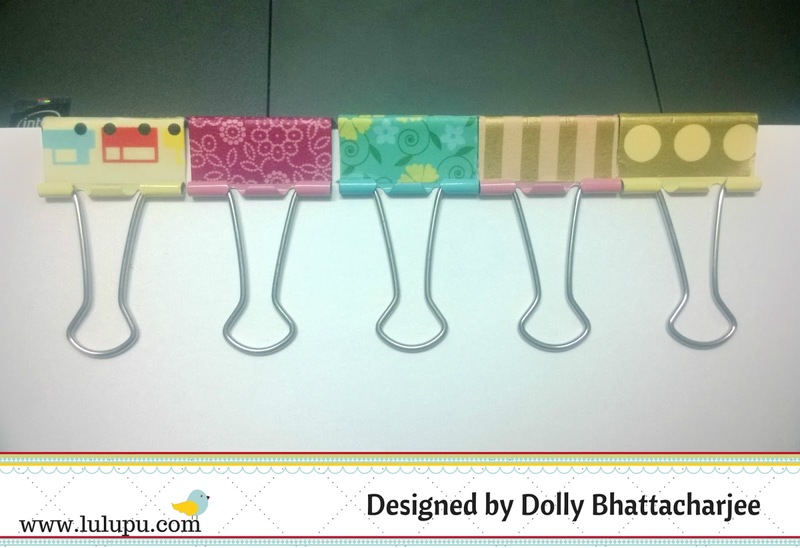 Dolly here, on the last day of the year 2015 to share some washi tape ideas with you all. 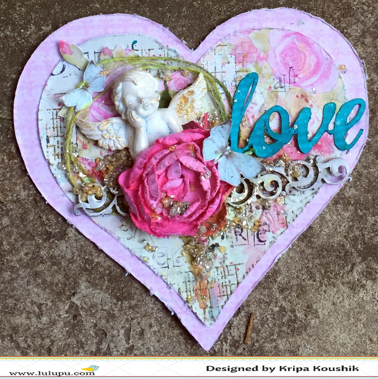 This month's theme is based on the use of washi tapes and mod podge and it surely can be used in a variety of ways. Hope you all have already linked your creations for the monthly challenge. If not, you still have a day's time. For my project, I have re-created my mouse pad with a layer of washi tape and mod podge to give a final sealed look. 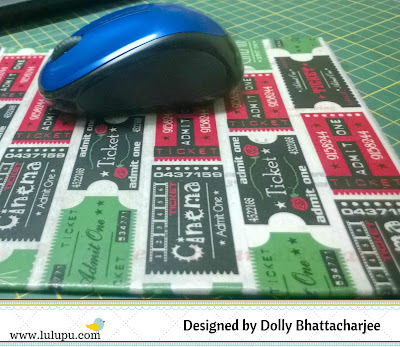 You can see the picture below on how can any plain mouse pad be transformed into your favorite colors or patterns with washi tapes. 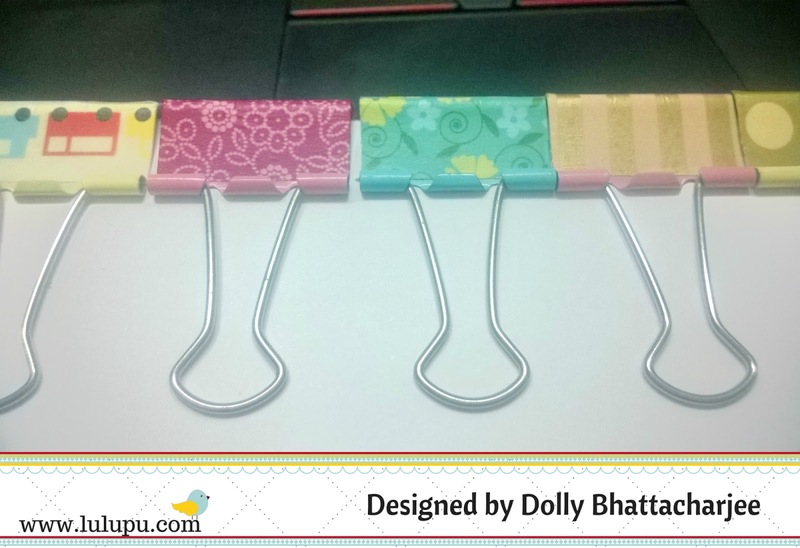 I have also used some binder clips and covered them with washi tapes to make it look more interesting. A lot of different stationary can be customised with washi tape to make it look cuter. Take care and Keep crafting! Glitter Light Gold Japanese Washi Tape, Gold Script Japanese Washi Tape) on a Kraft base. Next is a layer of texture paste through a stencil. Finally, more pieces of torn washi tape and some embellishments. Washi strips added just the right interest to the background, enough to not use any stamping at all! The challenge with using washi was that it wouldn't stick on texture paste and because I used small torn strips it was even more difficult keeping them down on the bumpy textures. Mod Podge Matte 4 oz came to my rescue, as it dries transparent, you can't even see it and those tiny pieces of tape will stay there forever! You have two more days to link your entries for this month's challenge here. Its now time to say my final goodbyes. I've had a wonderful journey last two years with a very talented bunch of fellow designers and so much love from all of you for which I'm ever grateful. 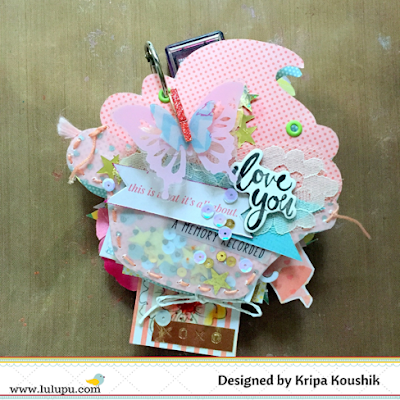 A huge thank you to Karuna, who trusted me (more than I did) with an invitation to join her DT at the time when I had just started scrapbooking. I will miss working with you. Here are my favourite projects from this year. This mini album is definitely top of the list for me as I discover the possibilities of creating interest with textures (minus wet media) You can see all the pages here and tutorial here. 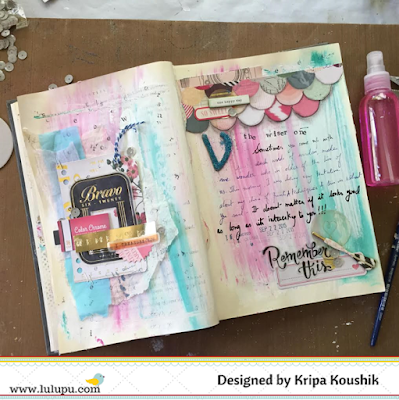 Memory keeping is what attracted me to scrapbooking in the first place and I'm thoroughly enjoying creating in this altered book journal. You can see two more pages of this book here and here. This year I made more cards than layouts. Click here to see closies of each card. Another card which I really enjoyed making. Wish I had an endless supply of these cherubs. You can read through the tutorial here. 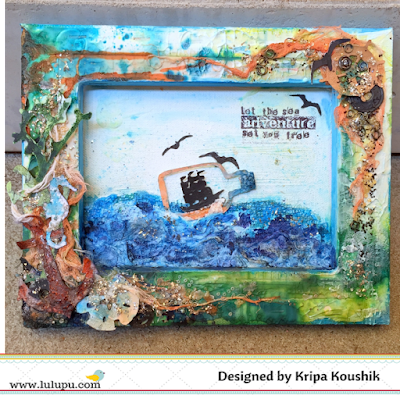 Finally, a reverse canvas inspired by the sea. More pictures and details here. When I was going through my projects trying to choose favourites, it was easy to see how much my style has evolved through my time as a Lulu Pooh thanks to encouragement from my wonderful fellow DTs - Manu, Tanvi, Neha, Dolly and Karuna and all of you who read my posts and leave me comments - they mean so much to me. I will continue to share my art journey on my blog - theColourPress and will be super thrilled if you visit me there. Wishing you all a joyous 2016. Washi Tape Ideas & a Goodbye! Tanvi here today & sadly this is my very last post here. This month the focus is on Washi tapes & Mod Podge, both very versatile products. Lulupu has a huge collection on washis in the store. These tapes are so handy to decorate/alter a project in a jiffy. The summer fun 2 washi tape in my DT kit was just right to make a travel journal cover. I neatly covered the book with washi tape & embellished the cover. 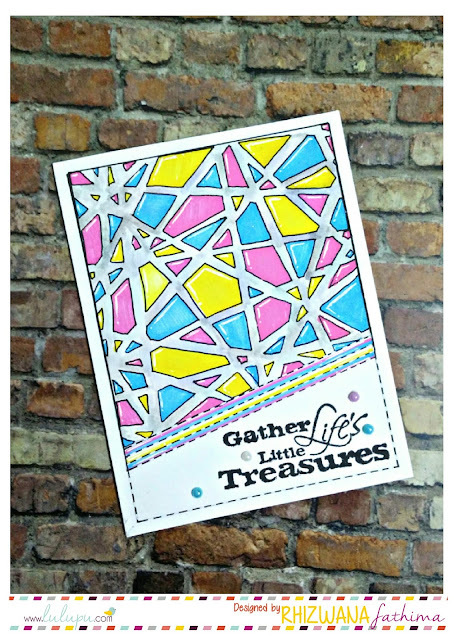 Over a period of time washi tape loses it tackiness & that’s where mod podge comes to the rescue! 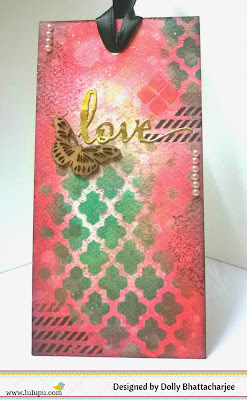 I have added mod podge dimensional magic to the label die cut & polaroid wood veneer. The postcard & postal stamp are embellies I made with shrink plastic. The antique 'passport' charm was a perfect addition to the page marker. Glue several strips of washi tape diagonally to the phone cover until the back is covered as desired. To add a bit of color I partly used a different washi tape. With a craft knife, trim off the excess tape to get a neat finish. Cut around the edge of the camera hole and also other slits on the cover. Add another layer of Mod-Podge to seal the washi tape. Let it dry for 24 hours and there you are, a one of a kind phone cover! Remember you still have time to enter the current challenge. As I mentioned, this is my last post here and time to say a final goodbye. Thank you, Karuna, for the opportunity to work for Lulupu, the incredible support you always gave us & the freedom to think & execute made the tenure at Lulupu so much rewarding! Best wishes for your future endeavors. Lots of love to little “K” too! Kripa, Manu, Dolly and Neha, you have all been such inspiring and supportive teamies, let’s all stay in touch! And lastly, sincere thanks to all the readers for constant support & encouragement. I will be active on my blog and FaceBook page, so stay connected ! Leaving you with some projects which I enjoyed making. The colours, the textures, the embellishments, loved everything but this clock. This was one project with which I had a really hard time with, but loved the outcome. I had so much fun making this interactive baby album. 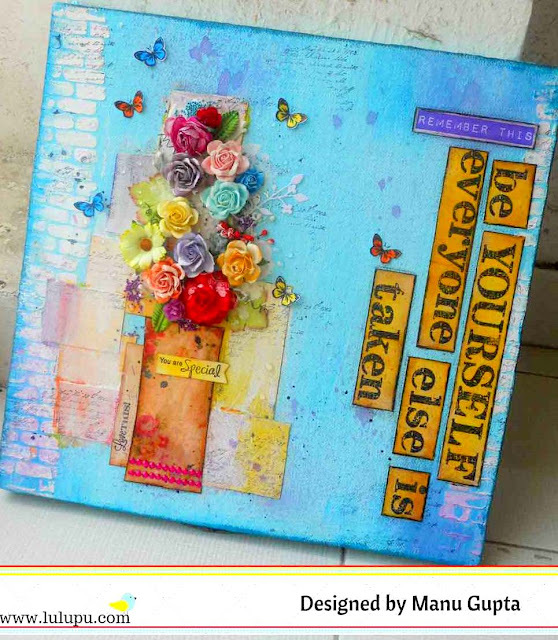 This tag book album is very special as I made my first video tutorial! Neha here! December is my last moth at Lulupu and this is the last post. Its been a great and the most memorable journey here at Lulupu , It made me learn so much and have definitely grown as a better crafter, but sadly it has to end. I haven’t tried chalkboard style before, so I was a bit unsure but now all my doubts are clear. I just put chalkboard washi tape on a CS and trimmed it according to the need. 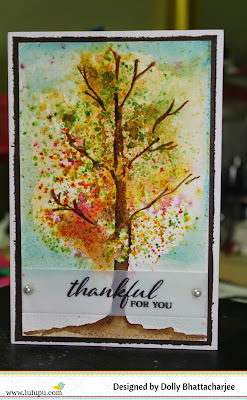 Then I have used pigment inks for stamping the sentiments. 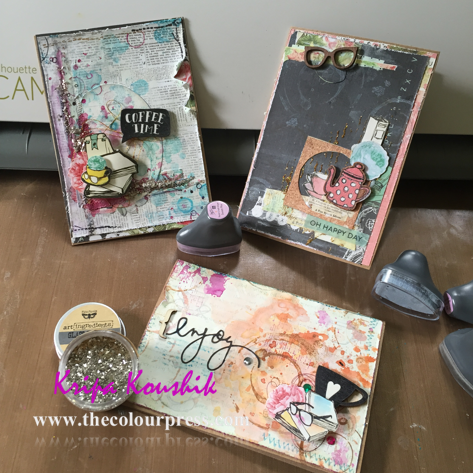 I stamped sentiment 2-3 times with pigment ink so there visibility is better and clear. For this I used my MISTI tool as I had to stamp 2-3 times. It makes your work so easy. I just love it! One thing you have to keep in mind while stamping with pigment ink on tape is that it takes time in drying. So leave it without disturbing till it dries completely otherwise it will smudge. For first card I created the chalkboard panel and matted it with a blue CS. Also, wrapped some twine around it. Next I matted it over ivory CS which was stenciled with DI (broken china) and stencil and lastly matted it over a black card base. Here comes the second card. For this card I have used the same above technique for chalkboard effect. 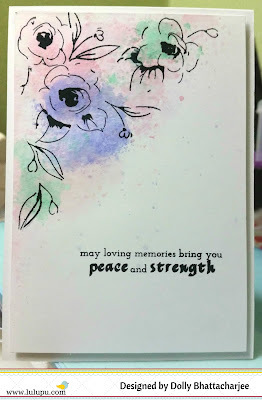 Did some stamping with black archival ink on ivory CS using altenew wild hibiscus stamp. Also heat embossed few flowers using golden EP. Then fussy cut them and colored with DIs mild lavender and Victorian velvet. Added some liquid pearls gold in the center. Also added a strip of golden glitter sheet beneath the chalkboard panel and arranged embossed flowers and my card was ready. I hope you like these cards and will try your hands on this chalkboard washi tape. And now is the time to say the final goodbye. I will be active on my Facebook page. Will love if you connect with me there. 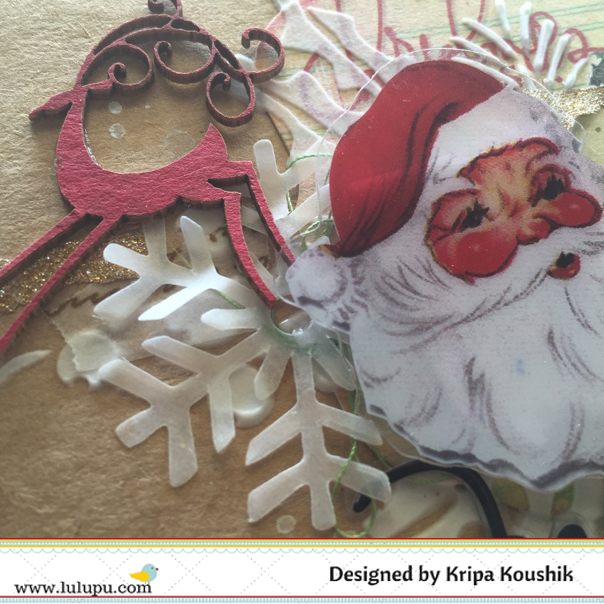 Lulupu was the first blog whose challenges I use to enter last year and first one to take me as DT this year in January I am really thankful to Karuna Chauhan for believing in me and giving me a chance to design for Lulupu. This blog gave me the wonderful opportunity to work with some really awesome and talented team of designers, Manu, Tanvi, Kripa and Dolly. Lastly, I would like to share few of my most favorite projects for this year. I really enjoyed making these projects for Lulupu. Next one is a Luminary. I was very happy the way it turned out finally. 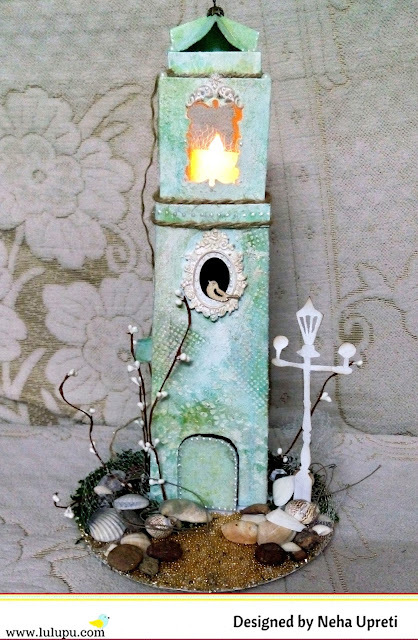 A lighthouse made from scratch. It was very much appreciated by everyone. 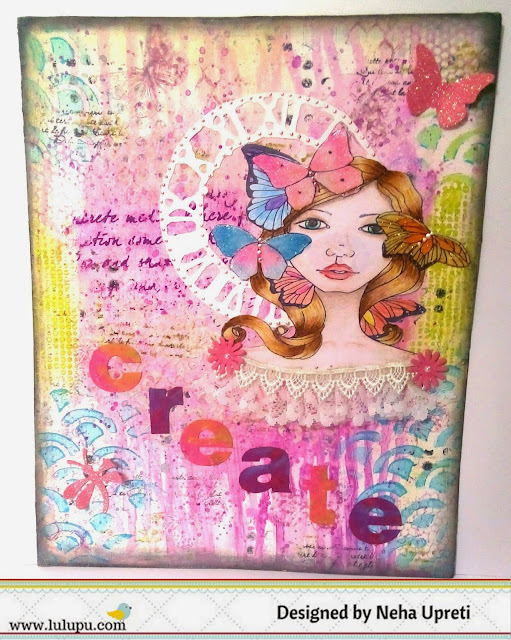 My favorite Mixed media canvas with gelatos. I also tried my hands on CAS cards for the very first time. I hope you guys also liked these projects. Thanks you very much for always visiting and appreciating my work. I hope the coming year brings with it a lot of happiness and prosperity in your life. Wishing you a very happy new year in advance. We have some amazing news! 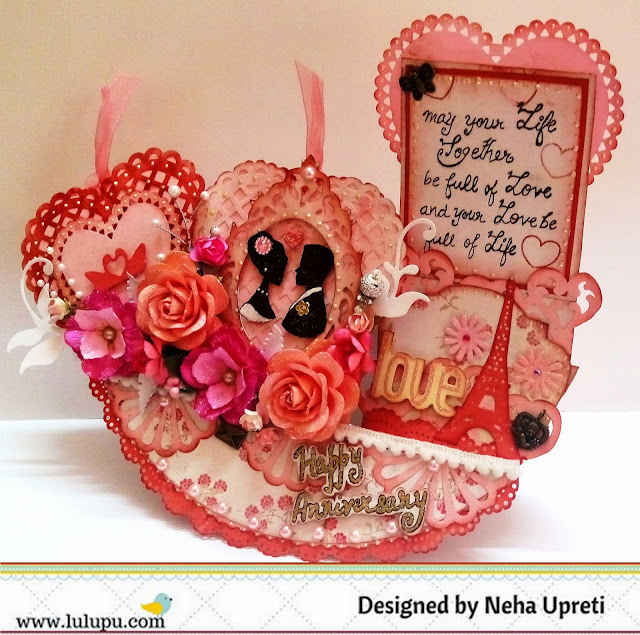 We are excited to present to you our first Online Video Class - A Beginner Course in Quilling. 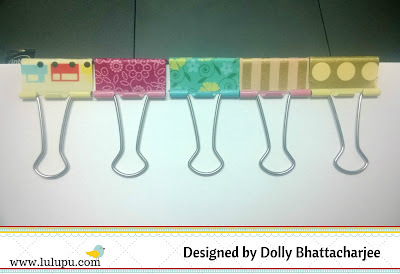 A very delicate art of creating unique shapes by rolling and pinching paper strips, not only is Quilling fun & easy to learn, it is also one of the least expensive hobbies. 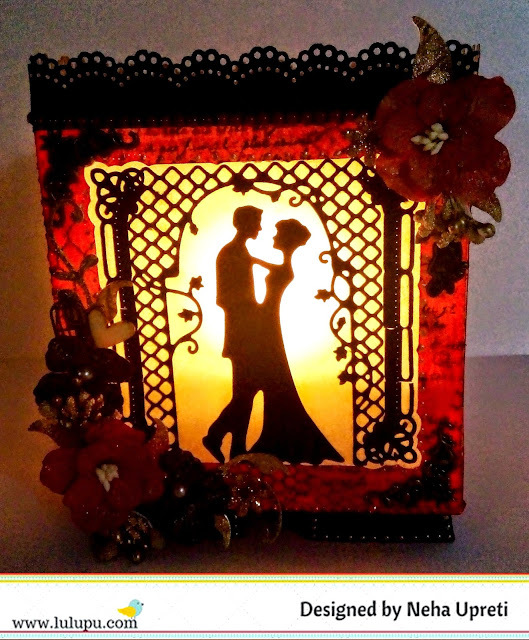 Quilling is also known as Paper Quilling or Paper Filigree. 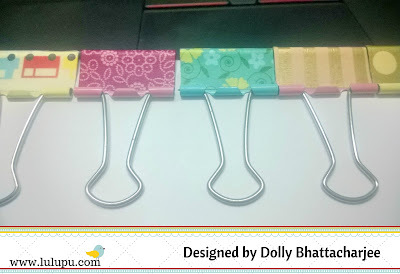 She learnt the basics from the pamphlet that came along with a beginner Quilling kit she purchased at the mall, reading books and watching videos online. However, over the years, she developed quite a few DOs and DON'Ts of her won through trial and error. It was then that she realised that there wasn't a comprehensive Quilling Course that taught not only the HOW-TOs and WHATs of Quilling, but also the WHAT-NOT-TO-DOs and the WHYs of it. So she decided that she'd make one and that's what we have for you here. Home Decor Monogram and a few Fond Memories!!! This is Manu here and it's finally that time of the year when I'm sharing my last post here as the Lulu-Pooh !! I'm sad, yet Happy for there will be amazingly new talent the next year to take this platform leap years ahead!! Lulupu has been a great platform for me and I have grown leap and bounds here with the truly talented design team members. I hope you do remember our this months challenge, It's all about putting up pretty creations and adding much more to your home space.. and yes, the twist is to use the Washi tapes and Mod Podge! I have made a super cute baby themed project using the Washi tapes and Mod Podge! I have a picture tutorial with it as well, so sit back and enjoy while reading how I make this pretty one! Take the MDF monogram and gesso it all (you can see mine having a little color beneath, it was green that I had painted initially, but then opted out and gessoed it back again). Once the gesso dries, I painted it with a white acrylic color. Since this was a boyish project, I took a blue based pattern paper and made the monogram alphabet copy. Start adhering the Washi as per your choice. There's no start or stop area and you can applying Washi to the complete monogram if you wish to!! Cut out the small parts of washi peeping out with a cutter to have a clean look. Here's my monogram, complete with the washi !! Once I was satisfied, I had sand the edges of the complete monogram to remove excess papers on the edges and this also blends the paper with the MDF giving it a neat and clean look. Once done, apply a generous layer of Mod Podge! Embellish as desired!! So far, this is one of the cutest baby project I have done!! This sure looks very pretty to be used as a Nursery Decor! 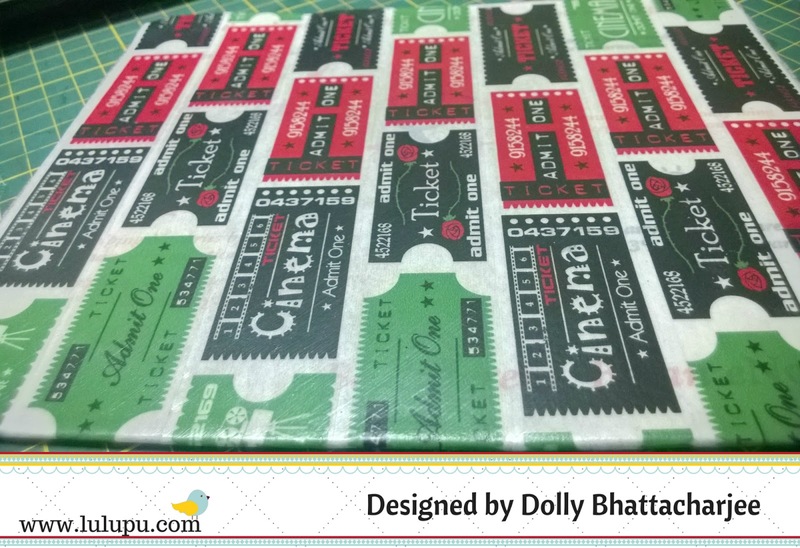 Here are a few more closer look at the washi tapes placemenets. I hope you liked my take on this challenge and I must say that I'm super impressed with the Washi tapes(yes, I have not used them before) and I'm pretty sure that I'm stacking more of these pretties in the time to come! And now comes the Farewell part.. Farewell's are always sad!! but then working with Karuna, Tanvi, Dolly, Kripa and Neha has been the best part of it. It has helped me grow as an artist and learn about soo much!! Thank you Karuna, for giving me an opportunity to work with Lulupu and also with some of the best talents in the industry. I remember the day I received the e-mail from you about the DT selection and I was jumping and thumping with joy!! This was a real booster for a newbie like me and I'm sure that the new talent joining in will receive a great platform to grow and learn each day here!! I will be always active on my FB Page and Blog. Would love you guys to connect with me there!! Before signing off, Here are a few glimpses of my work that was showcased before! I loved making my creations for Lulupu, I hope you all enjoyed them too. My very first for Lulupu and I love this one to the core!! Mixed Media project!! this was my maiden attempt at Mixed media and I totally loved the outcome! A Few cards that I did for the Lulupu challenges! This CAKE shaped album remains my favorite and is super close to my heart! 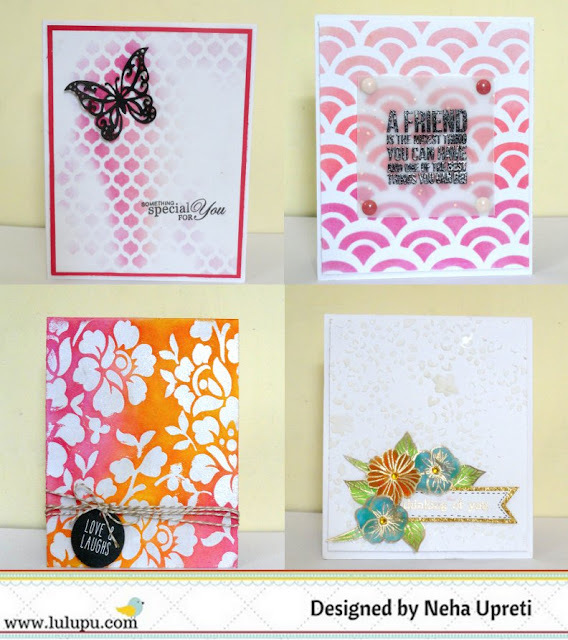 It was fun trying out different elements in these cards and I so love the Altenew stamps! Thank you Friends for taking time out to visit my work and also leave me words of appreciation!! This sure means a lot to me and I hope you all loved the inspirations as much as we loved making and sharing them with you! Wishing a very Happy, prosperous, healthy and lovely New year 2016 to you and your loved ones !